Additional Info: Minor age, used. Photo View Postcard. Black and white. Cardstock. 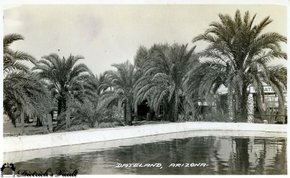 This glossy photo card is titled, "Dateland, Arizona." Frashers Inc., Pomona, Calif. From Pfc. Thomas OMann, 355th Engrs. Military Postmarked 1945.